Insurance Tip No. 1: Buying term insurance and investing the difference may be a dumb move. LARRY Explains: If you are in it for the long haul, buying term and investing the difference can be a dumb move for many reasons. The primary reason is that few people have the discipline to invest the difference. Most likely, this money will be spent just staying afloat. Even if you do “invest the difference,” how will you do it? The data indicates that Canadians are not consistent investors, although they have the best intensions. Insurance Tip No. 2: You may not need long term care insurance. LARRY Explains: Don’t get me wrong. Many people do need long-term care insurance. But before you grab the phone to us, consider whether you really need this insurance. It provides assistance with daily tasks for those who need some help in order to remain independent. The primary benefit of long-term care is that it may permit you to receive care in your home, so be sure your policy covers home care and not just nursing home care. Insurance Tip No. 3: The type of policy you buy may be as important as determining the amount of coverage you need. LARRY Explains: The focus of the insurance industry has been to persuade people that they need to purchase more life insurance. An even more critical issue may relate to the kind of policy you buy. Your need for life insurance generally changes with age, but not always. This is significant because term insurance is relatively inexpensive when you are young increasing extensively as you get older. Permanent life insurance has much higher premiums initially because it contains a savings element; but over the long haul delivers the results required of insurance, cash and an assured death benefit value. Insurance Tip No. 4: Blending term and whole life coverage into one policy is the secret your agent doesn’t want you to know. LARRY Explains: A blended policy combines term and whole life coverage into a single policy. Over time, the term portion of the policy is replaced with whole life. The bottom line is that a blended policy can result in lower premiums, higher cash values and higher death benefits because of lower sales costs. Insurance Tip No. 5: Insurance for singles and children can be a smart buy. LARRY Explains: I know it sounds counter-intuitive. Children don’t earn income and singles typically have no dependents. Since the primary purpose of life insurance is to replace lost income and other significant expenses, why would you insure the lives of children or singles? Insurance on the lives of children is not generally necessary. But there are circumstances where it might be a good idea . . . as the child is likely in good health which a plus for purchasing insurance. First, insurance at a young age is very inexpensive and it can provide a guaranteed right to purchase added insurance at an older age without further evidence of good health. It may also be structured as a great saving of capital tool. Insurance Tip No. 6: Choosing the right health care plan is a critical decision. LARRY Explains: You have many options for selecting health insurance. The one you pick may be your most important financial decision. If you are covered at work, you may be able to select from various options. Check out the coverage and costs carefully. My advice generally is to focus on big ticket items. It may not be worth the additional premium to cover smaller costs. Insurance Tip No. 7: Your auto insurance should cover replacement with original parts. Insurance Tip No. 8: Your agent does not have to act in your best interest. 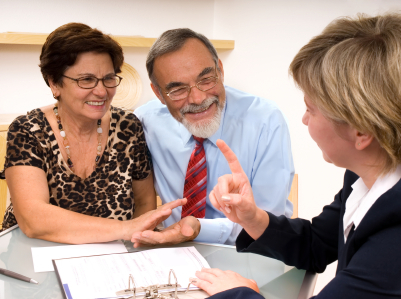 LARRY Explains: The issue is whether or not your agent has a “fiduciary” obligation to you. If so, he accepts the highest duty of loyalty and care. He cannot have any interests that conflict with yours. In most states, however, insurance agents are not fiduciaries. They have no obligation to place your interests above their own or above those of the insurance companies they represent. Insurance Tip No. 9: Disability insurance may be the most overlooked part of your financial plan. LARRY Explains: If you knew the data, you would take a hard look at disability insurance. Now is the right time since you probably don’t have any disability coverage. There is about a 40% probability that you will have at least one disability that lasts three months or longer before you reach age 65. Insurance Tip No. 10: Company ratings are not the most important factor when buying cash-value insurance.